The Head of The School Wu Chung-Xu has explained in detail the general principles of different teachings in his book "Common Teachings of Immortals and Buddhas", the truth of “the 3 teachings returning to their unity". Methods of WuLiuPai School took the major Buddhist works such as “金刚经”, “楞 严 经”, “华严经” and others, combined them with the works of perfect people in each school of Taoism, fused it into a single system, created the original School Dragon gate Teaching of Perfect Truth of Taoism. So the WuLiuPai School does not fully belong to Dragon Gates school now. Ch’an guru Liu Hua-yang first was a Buddhist monk, after that he rejected the monastic life and started to follow the teachings of the Tao, he underwent a ritual of initiation into students in the School of the true man Wu Chung-Xu, having received his instructions and made practical and theoretical investigations and testified the identity of the methods of early Buddhism and the methods of heaven small circle in Taoism. After that, both looked into thoroughly and understood, he wrote the famous work "Book of Understanding Life" 慧命经 and "Confirmatory Teachings of Golden Immortals” 金仙证论 (jin from Huayanjin and indestructible body jingan indicate the level of shenxian). 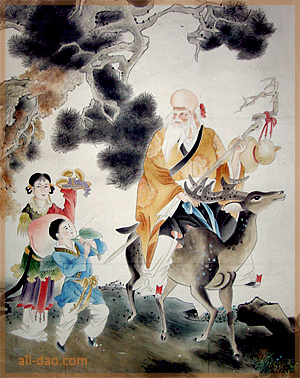 The books of School fully include the works of Wu Chung-Xu and Liu Hua-yang, in which are written the most important works of the Northern school of alchemy (the dual perfection of nature and destiny), Southern, Eastern and Western schools of alchemy, as well as school of Zhang Xanfeng and Middle School. In addition to works of "True Principles of Heavenly Immortality", "Common Teachings of Immortals and Buddhas", "Book of Understanding Life" 慧命经, "Confirmatory Teachings of Golden Immortals” 金仙证论 school WuLiu also includes: 八脉经 "Tractate of the eight channels" by the perfect man Zhang Ziyang (Zhang Boduan) - Southern school, 后天串述 "Coherent description of post-heaven" and 涵虚调息法 "Hanxui methods of control breathing” by Lee Hanxui, 潜虚翁调息法 "Qian Xuiwen methods of control breathing" by perfect man Lou Xixin 陆西星, and "Xanfeng methods of control breathing" by perfect man Zhang Xanfeng. So many teachings of Taoist schools of alchemy were connected into a coherent whole. Summing up, it posits that in fact the great Tao of alchemy (golden elixir) in all cases is identical to one method. If we talk about our transmission, the WuLiuPai school, continuing the tradition of the Dragon Gate Perfect Truth school (LongMenPai) has collected best practices of all methods of alchemy, Buddhist methods of practice, other methods of practicing Taoist schools, and joined all them into a single system. Thus our school forms the WuLiuPai school, separate from the LongMenPai. Since the establishment of the school have passed more than 400 years, it has received extensive development and continues unabated. And still its foundation is strong, and successes are numerous, the number of Tao practitioners in our school is large. The mastery of school posits that the main is perfection of the man, perfecting primordial jing, qi and shen, thereby achieving longevity and health. Our school belongs to the direction of "pure perfection" (i.e., single person), dual perfection of nature and destiny (soul and energy), but in fact it kept all the 3 primordial elixir methods (i.e. single, pair perfection and external alchemy), but is most evidently manifests the method of heavenly primordial perfection (single person perfection). Starting practice of the school WuLiuPai primarily uses mobilization of mechanism of pre-heaven qi inside him, circulation of it in 14 channels of his own body, then spreads it in every part of the body, making his own zhenqi go to 4 limbs and all the bones of the skeleton, achieving regulation of yin-yang of his own body, exactly what is described as the passage channels of Chinese medicine and regulation of the physiological balance of Western medicine. Thus this leads to health, if man has diseases then it is cured, in the absence of disease – health improvement, prolongation of life and longevity is achieved. Main goal of WuLiuPai School - a way of perfection and confirmation by your own experience of becoming a Buddha and Immortal, it is the result of perfection in the practice of our School Wu Chung-Xu – Liu Hua-yang. In the process of perfection many people achieved results and completed the Tao, so Wu Chung-Xu – Liu Hua-yang School is a staircase of shortest way for perfection in the Tao.